Breakfast is the most important meal of the day. Don’t let a hectic morning sabotage your chance of getting in a bite to eat. These five innovative kitchen gadgets will make eating breakfast a breeze. Sure, your standby coffeemaker does the trick, but how often do you end up pouring half a carafe down the drain? You'll always brew the perfect cup of coffee, hot chocolate or tea with the Keurig® Platinum Brewing System. You can personalize your morning beverage to perfection by programming the cup size and water temperature; plus, you can enjoy gourmet coffee blends without wasting a drop with the single-serve K-Cup® packs. We're especially fond of the Folgers Gourmet Selections K-Cup® packs in flavors like Black Silk, Lively Colombian and Vanilla Biscotti. So if you like your coffee flavored, and your loved ones don't, you can all have your own way! 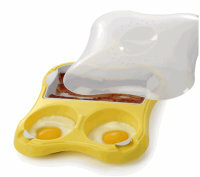 If you like to have a big breakfast but are small on space, consider picking up one of these 3-in-1 breakfast stations. As your coffee brews, you can prepare toast, eggs and breakfast meats in the toaster oven and griddle top. The oven comes with a 15 minute timer and temperature control setting. This is perfect for studio apartments and for the office kitchen (and it will also earn you brownie points with coworkers). 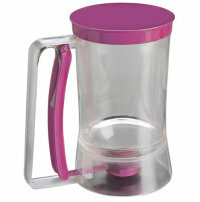 Those who struggle with finding time to eat breakfast in the morning will love this portable blender with travel cups. For an easy breakfast on the go, blend a banana, handful of strawberries, 1/2 cup of yogurt and milk. Having trouble eating your veggies? Try making a tasty green drink to get your daily servings of fruits and vegetables while making the trek to work. 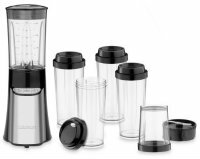 This compact blender comes with four 16-ounce travel cups, making it easy to cater to your busy family. Save yourself the time and money of picking up fast food and make your own yummy breakfast sandwiches instead. Simply add cracked eggs and your choice of breakfast meat to this microwave-safe sandwich maker and nuke it for a few minutes. In the time it takes to toast the bread you’ll have all the fixings for a homemade breakfast sandwich. The meat tray comes with ridge edges on the bottom to catch any grease as the meat cooks. Not only does this keep the meat crispy, it makes it a healthier option too. Sometimes eating breakfast at home just isn’t an option. The kids might have to eat breakfast at day care while you try to grab a bite at your desk catching up on morning emails. Now you can easily take a breakfast staple to-go with a special cereal container. Just freeze the bottom portion of the container at home to keep the milk nice and cold. Fill the top half with your favorite cereal. 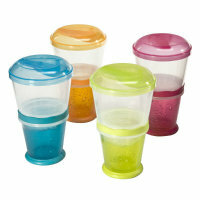 The BPA-free container comes with a leak-resistant lid, saving you from the headache of crying over spilled milk. Everyone loves a perfect, fluffy pancake in the morning, but no one loves the mess involved with making it. Avoid getting pancake batter all over the countertops by using a batter dispenser. With a holding capacity of four cups of batter, this gadget will pour out the perfect amount of batter for each pancake. Clean up is a snap since it’s dishwasher safe. Bonus: it can also be used for waffles, breads, and cupcakes. 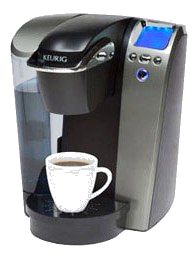 K-Cup and the Keurig brewer trade dress are trademarks of Keurig, Incorporated, used with permission. K-Cup® packs for use in Keurig® K-Cup® Brewing Systems.